"Holy Hop, Batman, this beer has aroma." Hops are casted nine different times, it’s a breath-deep-and-shudder-with-pleasure kind of scent that’s all from the Citra hops. With a high alpha acid of 11%, Citra has a cacauphony of flavours and aromas --Citrus, passion fruit, grapefruit, lime, melon, lychee fruit, pineapple, mango, and papaya – and dominates this beer. Smashbombs olfactory tropical explosion shockwaves your face every time you lift the meringue foam towards you. It’s like the ecru-coloured top of a beer pie before it gives up and grips the glass. You can see the Victory malt’s signature in the amber lights in what is primarily a deep golden beer. And, yes, don’t be fooled --there’s malt going on here, too, as you’ll see in the firey body of this ale that makes Smashbomb Atomic look like it radiates its own energy. With the first taste, Smashbomb’s 70 IBUs are pronounced. This brew is a little bitter, but bitter like a grapefruit with three tablespoons of sugar on top. It’s also incredibly drinkable. The oddity that’ll keep you tipping the glass is that as this citrus peel front subsides, you actually gleen the sweet flavours of the Victory and Crystal malts. Then, as the bread-puddin’ bicuity sweetness of the malts are chased by the dry, tropical flavour of Citra and the fruit punch bouquet is all in your face with each sip, it’s all is so damn intriguing, you’ll be driven to keep on sampling...and sampling." Nice pouring IPA with a copper/orange colour. Two fingers of off white, khaki head crown the beer. Decent carbonation on the glass. Nice citrus aroma. Big grapefruit, papaya and melon are very present along with some malt sweetness. Some biscuit and breadiness make for decent balance on the nose. Quite nice. As the beer washes over the mouth, the grapefruit gives a pleasant kick to let you know you have a flavourful beer. As it calms, the biscuity malt sweetness comes though. The overall finish is a pleasant bitterness, leaving a appetizingly refreshing dryness. 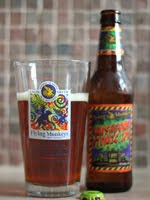 While not the first time I've enjoyed this particular offering from the Flying Monkey's, this was the first time in a bottle. I must say, I am glad they sorted out all of the issues with the LCBO trying to ban it. This is an incredibly solid IPA, especially for those that love the big citrus flavours (Thank you Citra hops!). At 6% ABV, you can enjoy many without feeling bad in the morning. Super fresh, this particular batch was bottled on August 17, 2011, only days ago. If you like hoppy IPA's as much as I do, this beer is one to grab when you see it in the store. The last shipment to the LCBO sold out in a week or so. A very solid beer for the summer! An "A" for sure.